Dimitri Kieffer is an engrossing and natural storyteller. 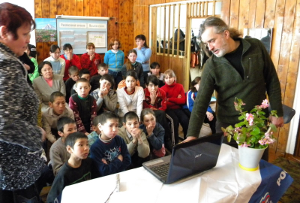 As a speaker, he tells the story of Nexus Expedition's continued journey from Anchorage, Alaska, across the Bering Strait, into and across Northeastern Russia and Mongolia. Dimitri is available for keynote addresses. Inspiring and drawing from a long and vast ocean of experiences with people, places, weather and nature, presentations are readily tailored to any audience. They can address powerful messages such as goal setting, risk management and teamwork. Please contact Jesse Perrell at Jesse(at)nexusexpedition(dot)com for additional information and availability. Here is a short history of Nexus Expedition presentations. Nexus Expedition has presented for schools, corporations, running and touring clubs in the United States, Russia, France and South Africa. "Nexus expedition- Report on the Spring 08 section"
"Racing the Planet: Ultra Endurance Running & Medicine"
"Around the World in 80 days or 10 years"
"Nexus expedition- Report on the Bering Crossing section"
"Iditarod Trail Running race presentation"
"Adventure running, Alimentation & Hydration"